My Weekly Indicators piece for the final week of 2015 is up at XE.com . Too soon to ttell, but we may be getting near an important turning point. ... [I]n 2014, a deceleration in housing's contribution to GDP was offset by an increase in governments' contributions at all levels. Neither Federal nor state and local spending has returned to their pre-recession rates of growth, and at the state and local levels, it is likely there will be further improvement. Possibly Washington can manage to avoid more own-goals. If so, those are pluses for growth in 2015, which should continue to offset the impact on the broader economy of the housing slowdown of 2014. In summary, when looking at the long leading indicators, all of them are moving in the right direction. [With a few caveats,] .... it is a safe bet that growth - including jobs and wages - will continue throughout 2015. Depending on what happens with governments' contributions (as set forth just above), my expectation is for YoY growth in 2015 to be approximately equal to its 2014 levels. If gas prices remain low, and housing picks up soon enough due to lower interest rates, then this may be the best year of the expansion yet. I am scoring this as one hit and one miss. 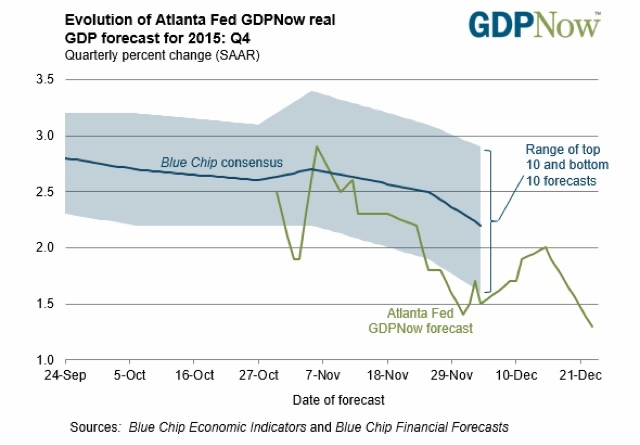 So far the Atlanta Fed's "GDPNow" estimator is calling for weak but positive growth in Q4 as well. Even though housing did pick up as I forecast, and even though government expenditures stopped being a drag, the super-strong US$ clobbered the globally exposed portion of the economy, and just about all of my mid-cycle indicators have peaked and started to decline. That's the miss. I always try to learn from my misses, and in this case that has caused me to integrate the US$ into my system as a short leading indicator. In the next couple of weeks, I will issue my fearless forecast for 2016. In the meantime, Happy New Year! I have my final post of the year up at XE.com, taking a look at how housing sales, prices, and inventory have changed this year, with a preliminary forecast for next year. Do the Underpants Recession Gnomes have a case after all? I concluded that "Until someone comes up with a credible scenario for Step 3, all we have is the Doomer version of the Underpants Gnomes." 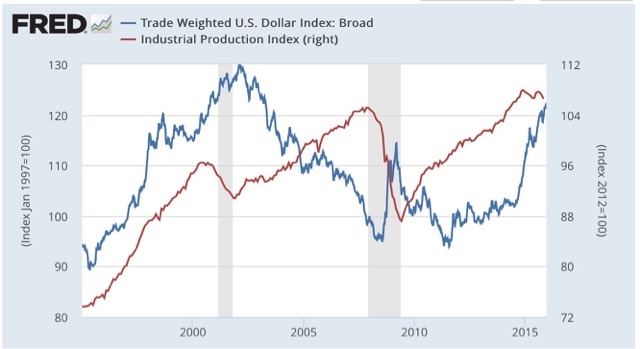 Since that time, however, there has been another deflationary pulse in commodities, and another run to new highs (since cooled off a little bit) in the US$. In short, a renewed surge in the US$ is doing a pretty good imitation of whatever would need to fill in line #3. That has caused me to put some further thought into the matter, and to consider modifying my position. The starting point is that, generally speaking, as China in particular becomes an ever larger factor in the global economy, the US feels more of the global effects, in a way it has not done in the last century. These will presumably become ever more important over time. It seems natural that the identities and strengths of the various long and short leading indicators should gradually change as well. With that in mind, let me next make two analogies. 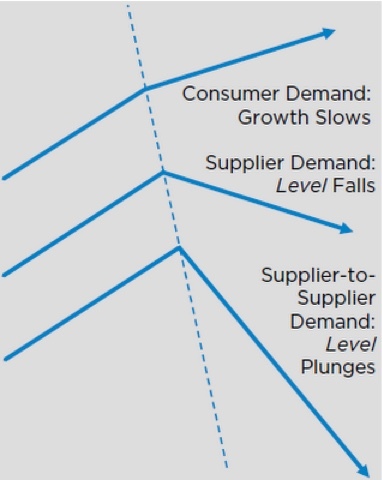 In this graph, China occupies the middle line, because that is the epicenter of the commodity collapse. China's "upstream" natural resource suppliers are the bottom line -- they get hit even harder. The US is the top line, the "downstream" consumer. 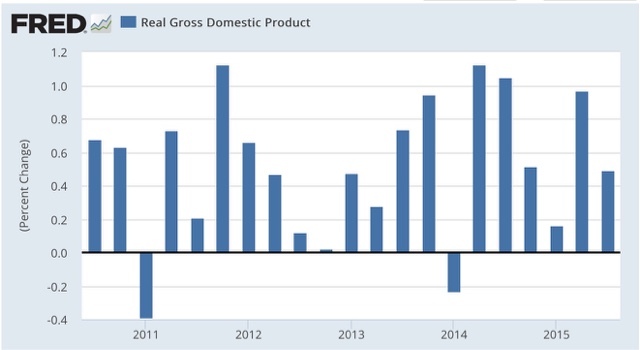 While US exports suffer, the US gets cheaper consumer goods in return, more than offsetting the effects of the downturn. While there is a drag on the US economy, the line still points up, albeit at a subdued level. Second, let's analogize to the Titanic. The ship had watertight compartments sealed at the bottom, but not the top. She sank because the water overtipped one compartment at a time. Had the ship's compartments been sealed at the top instead of the bottom, the Titanic would not have sunk. But its bow would have been very low in the water. So while it presumably could have limped into New York harbor, it would not have been a good idea to try to do so through a Nor'easter! The new global deflationary pulse that began in October has caused the slope of all three lines in the ECRI graph to point lower than otherwise - even though the US's line is still positive. This is the equivalent to the US economy of causing it to sit lower in the water. Domestic problems it could otherwise withstand might be enough to cause it to sink. Let's quantify that a little bit. Suppose 80% of the US economy is domestic, and 20% is directly exposed to global forces. 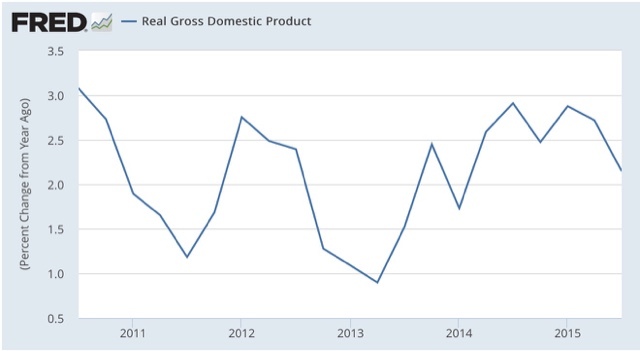 If the domestic economy is growing 2%, and the globally exposed economy is declining 5%, the overall economy still grows: (.8 x 2%) + (.2 x -5%) = +0.6%. But suppose the intensity of the globally exposed economy's downturn doubles. Now we have (.8 x 2%) + (.2 X -10%) = -0.4%. The overall economy contracts. 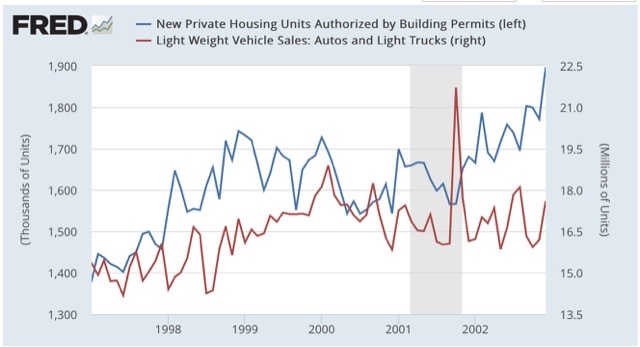 Housing permits only fell 175,000 at their worst, and vehicle sales declined 2.4 million on an annualized basis. Industrial production declined -2.3% before the onset of the 2001 recession; it is only down -1.3% from their peak now. It's worth emphasizing, however, that every other long leading indicator did turn over before that recession began, and in particular real money supply and the yield curve have come nowhere near their recession signals at this point, while housing permits after going more or less sideways for 4 months, finally made a new high (ex-NY, the state responsible for the May-June upward distortions) in November. It is usually wrong to think that "it's different this time," but I have no problem *modifying* the usual rules to take into account the growing secular trend of a more balanced globe. Thus, *if* I see a decline in housing and cars that is about half of what would in the past have signaled a recession, and at the same time if there is a renewed surge in the US$, I do not think I will wait longer before going on recession patrol. At the end of last year, I highlighted 5 graphs to watch in 2015. Let's look back one last time. Over the last 35 years, refinancing debt at lower rates has been an important middle/working class strategy. 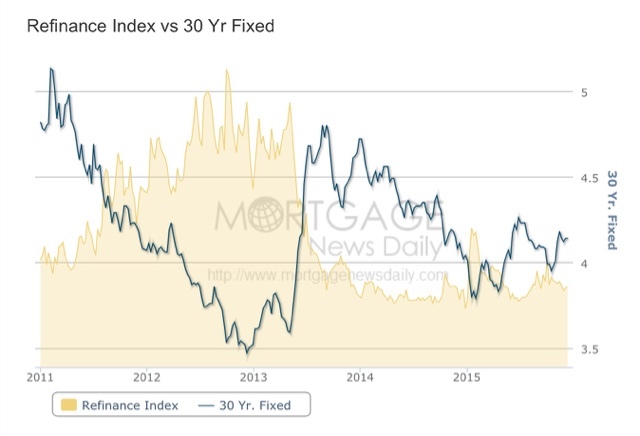 There is little room left for that strategy, and it looks like we have seen the low in rates for this expansion -- and possibly for this lifetime! If the middle class makes more progress in real income, it will have to come from further decreases in consumer prices (if that is possible), or increases in wages. How long must a worker labor in order to buy a gallon of gas? 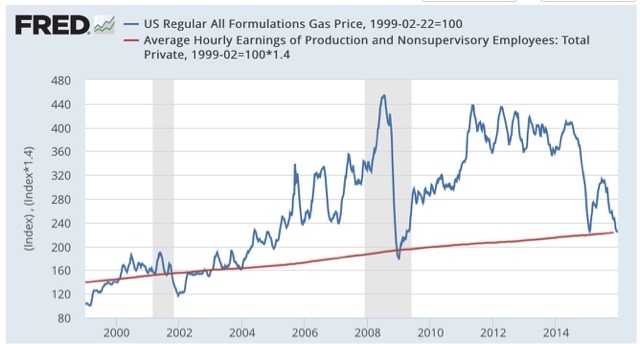 After skyrocketing in the lead-up to the Great Recession, gas prices collapsed, helping the consumer start to spend again on other things at the bottom of that recession. The steep drop in gas prices late last year and again this year took us almost all the way back to that bottom. 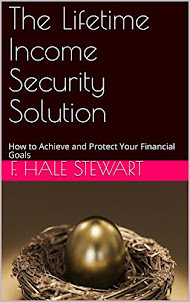 In 1986 and 2006, at first consumers saved the money, but once they loosened their pursestrings, the economy responded. Consumer spending, particular on durables like houses and cars, is what is keeping this expansion going. 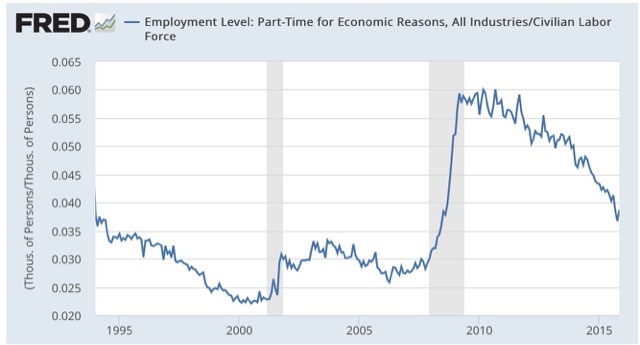 It just made a new post-recession low and is about 1.2 million, or 0.8% of the workforce, above its 1999 and 2007 lows. Still, this is only half the way back from its recessionary highs. In the 1990s and 2000s, nominal wage growth started to accelerate when the broad U6 unemployment rate fell to 9.9% and 9.7% respectively. 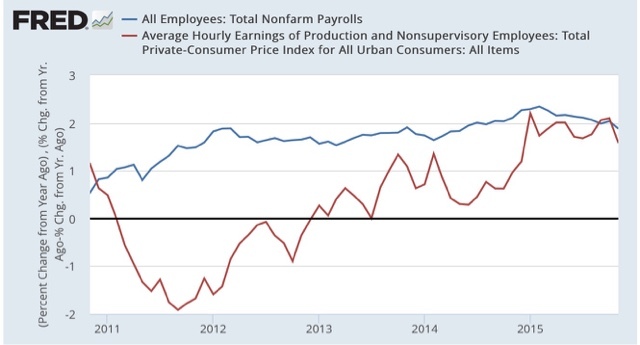 Last December saw an anomalous big decline in average hourly wages, so it is likely that with the next employment report to be released next week, nominal wages will finally break out significantly above 2% YoY. Low oil prices have continued to benefit consumers, although the strong US$ has muted their effect on the overall economy. Wage growth, driven in part by the decline in the broad unemployment rate, has finally shown a pulse, but not much more. 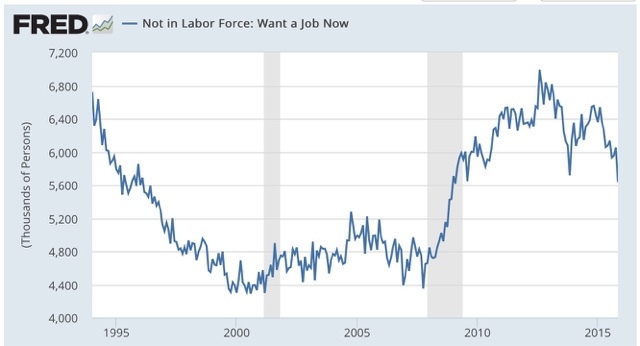 In the last several months, there has finally been a big decrease in the number of people not even in the labor force, but who want a job now. Still, if current trends continue, we won't achieve real, full employment like 1999 or even 2007 for about another 18 months to 2 years! Next week I will detail 5 graphs for the year 2016. Some of the most critical graphs will change, and some will remain the same.